The second-generation Porsche Cayenne's model lineup is the first to offer a gasoline-electric hybrid variant alongside gasoline- and diesel-only models. The Cayenne S Hybrid, which shares its platform with the Volkswagen Touareg and Audi Q7, offers an average fuel economy of 28.7 U.S. mpg (8.2 liters per 100km), making it the most efficient gasoline-powered Cayenne and the least polluting Porsche currently available in terms of CO2 emissions at 193 grams per kilometer. 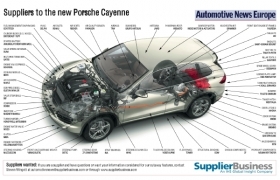 The Cayenne diesel’s fuel economy is 31.8 U.S. mpg (7.4 liters per 100km) and its CO2 output is 195g/km. The hybrid Cayenne design helps reduce CO2 emissions by using battery power to assist the main engine. For example, when waiting in traffic the engine will stop. The battery will take over and be used to get the car moving again. The battery will move the car until more power is needed at which time the engine will take over. German supplier Robert Bosch GmbH worked with Porsche and VW on the hybrid system so that it would offer a smoother transition between fuel- and battery-powered driving modes when compared with conventional mechanical power-splitting devices. Bosch supplies the hybrid module – which contains the motor generator – as well as the power electronics. These are regulated in concert with the combustion engine by the supplier's hybrid control unit. The unit processes data from sensors in the hybrid module, engine, battery, brake and accelerator pedals in real-time to determine how much torque the engine and hybrid module should each contribute. The torque is then adjusted within milliseconds to suit the driving conditions. Germany's Fischer Automotive Systems GmbH & Co. KG augments interior functionality and aesthetics in the premium SUV with its air vents, decorative gearshift cover plate and center console cupholders. Westfalia Automotive enables the Cayenne to pull a load by supplying detachable and retractable trailer hitches. The supplier expects about one-fifth of vehicles sold to be equipped with one of its hitches. Porsche assembles the Cayenne at its plant in Leipzig, Germany. Prices in its home market start at 55,431 euros (about $70,990) for the base model and 78,636 euros for the hybrid.